Keep your eyes open . . . your head down . . . and your love secret. Sarah Jac Crow and James Holt have fallen in love working in the endless fields that span a bone-dry Southwest in the near future—a land that’s a little bit magical, deeply dangerous, and bursting with secrets. To protect themselves, they’ve learned to work hard and, above all, keep their love hidden from the people who might use it against them. Then, just when Sarah Jac and James have settled in and begun saving money for the home they dream of near the coast, a horrible accident sends them on the run. With no choice but to start over on a new, possibly cursed ranch, the delicate balance of their lives begins to give way—and they may have to pay a frighteningly high price for their love. 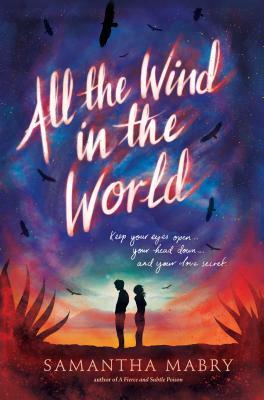 All the Wind in the World is a breathtaking tale of dread and danger, romance and redemption. Samantha Mabry credits her tendency toward magical thinking to her Grandmother Garcia, who would wash money in the kitchen sink to rinse off any bad spirits. She teaches writing and Latino literature at a community college in Dallas, where she lives with her husband, a historian, and a cat named Mouse. She is the author of A Fierce and Subtle Poison and All the Wind in the World. Visit her online at samanthamabry.com or on Twitter: @samanthamabry.